The Eaton Model 53BTX (formerly Hayward Strainer) industrial strainer can be used on the suction side of the pump to protect it from large solids or on the discharge side of the pump for finer solids collection. 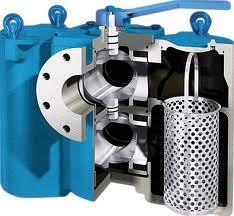 Use this strainer in applications where the pump cannot be shut down to clean the basket. This type of basket strainer has two separate strainer basket chambers. When one side is full, flow is diverted to the other side while the dirty side is cleaned. Materials of construction include cast iron, cast steel, bronze and stainless steel.